Do you need Potable Water stored? Many of you who have taken steps to ensure your family’s safety probably have the same reaction as I did. Wow! This person is so un-willing to understand just how delicate the supply chain which brings us all food and water truly is. But, I was able to keep that voice in my head from coming out in a loud manner, but it was still there. I asked this person if he had heard about the cases just in the past year where the municipal water sources from several large cities were determined unsafe to drink. Did this person understand in these cases, there was no warning, just the city and county authorities issuing warnings of the unsafe drinking water, and how dangerous the drinking water in their community is? They had never heard of such things happening. GREAT FALLS — The Blaine County emergency manager says that Chinook city water is not safe to drink at this time following a water main break early Wednesday. Tests are being done to determine if the water is potable, but it’s unknown how long people will have to go without drinking water. The Blaine County Emergency Management Office will be handing off bottled water at the Blaine County Fairgrounds Commercial building until 10 p.m. Wednesday. Additional water pick-up hours will be held on Thursday from 10 a.m. – noon and 5 – 7 p.m.
Portland, Oregon has been forced to dump 38 millions of gallons of drinking water, because a teen urinated into a water reservoir. Sadly, this is not the first time this sort of thing has happened. CHARLESTON, W.Va. — As 300,000 people awoke on Friday to learn that their tap water was unsafe for brushing teeth, brewing coffee or showering, residents and businesses expressed a mix of anger and anxiety in coping with an industrial accident with no clear end in sight. Schools were closed, restaurants locked their doors and hotels refused reservations. Store shelves were quickly stripped of bottled water, and traffic snarled as drivers waited to fill jugs from tankers delivered by the National Guard. “It’s worrying me so much I’m having chest pains,” said Cookie Lilly, 71, who waited with her husband to get a ration of four gallons of water at the South Charleston Community Center. TOLEDO, Ohio – Toxins possibly from algae on Lake Erie fouled the water supply of Ohio’s fourth-largest city Saturday, forcing officials to issue warnings not to drink the water and the governor to declare a state of emergency as worried residents descended on stores, quickly clearing shelves of bottled water. The city advised about 400,000 residents in Toledo, most of its suburbs and a few areas in southeastern Michigan not to brush their teeth with or boil the water because that would only increase the toxin’s concentration. The mayor also warned that children should not shower or bathe in the water and that it shouldn’t be given to pets. MINNEAPOLIS (WCCO) — There’s something very unpleasant happening in Cambridge. Tens of thousands of gallons of raw sewage have leaked into the Rum River. Monday evening someone spotted the sewage flowing into the river and called the sheriff’s department. A deputy arrived to find the mess oozing out of a man hole, 20,000 gallons total. No one knew about the dangers. All involved scheduled distribution of bottled water. Think long lines just to get potable water. All government authorities state everything is ok. I don’t fully trust these officials. Their responsibility is to maintain order, not care for the citizens. I have several quick suggestions for each of you to think about. 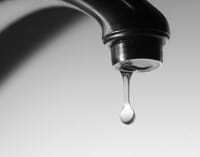 First, have you tested your water supply? If not, you can have a free water test completed by any local Ferguson Plumbing Supply. You just have to take a sample into them and they will have the results back in a few days. Next, one simple way to build your drinking water supply is to wash out your empty 2-litre soda bottles and fill them from your faucet. [Rourke: At a minimum this water could be used for sanitation and washing] The bottles are food grade containers and you already have them. In no time at all, you will have several weeks worth of safe water stored. My parents just went through a situation where their water had to be turned off for a couple of days. Luckily my dad is a believe in you must have a 3 day supply of fresh water at all times, so they were ok. I learned from him and keep my own 3 day fresh supply around. It happened to me. We just bought a new home that was on ‘rural water.’ The pump quit and the water district didn’t have enough money to replace the pump (it was at 12,000′ and quite a pump). I drilled a water well that at 600′ and in still in the rock, was dry. This new home was the first place we ever owned (at least in the past 30 years) that wasn’t on its own well. I was building a new 6000 sq ft shop and decided to harvest rainwater (we receive 40-60″ rain per year). I have always kept a month supply of H2O on hand. But have never had to to use it in an emergency. However, when the city of Stockton CA some how got sewage into the drinking water. It took three weeks or so to before people could drink the water. Supplies dried up in mere hours, that included out lying towns as well. You don’t have to be on ground zero to be effected. Anyway’s my daughters drove up there with some of my supplies of H2o. We have our own well. BUT, when the power goes out, we only have what is in the pressure tank until the pressure drops, maybe 30 gallons. So, we have 3 50 gallon barrels with water, but that will only be temporary – maybe 2 weeks of drinking and cooking with some dish washing. The answer for us was a pump to slide in beside the existing well pump. The drawback is that it is in front of the house and could be stolen in the night. So, it has to be installed, pump 150 gallons or so, and removed. It is a pain, but can be done in about 45 minutes, complete. At least it minimizes the risk of loss. I know . . . I need to order a spare, just in case. We keep our water frozen in jugs and bottles in our chest freezer, filling every available gap with water. This tactic accomplishes four things-we have many gallons of water (cold water with ice if it’s hot out and we lose electric), the water stays fresh because it’s frozen, we use some of it for our ice chests when we go shopping, fishing or hunting instead of purchasing ice, and the freezer runs less when full. We also keep prepared water in boxes from myfoodstorage, so in the event of, an event?, we can keep the freezer closed as long as possible. It’s a good idea to note the locations of water sources in your area, and be prepared with some buckets, disinfectant tablets, water filtering bottles, etc. findaspring is sort of a good site to scout locations. Many rural towns, at least where we live, have locations, usually near the fire department, where you can go and fill up jugs and barrels. If you live in a rural location, and you can’t afford a well on your property, call your local better business bureau to find out if there is someone in the area who fills water tanks. You can get a tank from Orcheln Farm and Home or perhaps another farm supply, starting at about $600. Some states will sometimes have a program where you can get low-interest financing to drill a well on your property, as long as you own the property, and are in residence. However, you must be somewhere near the federal poverty level in order to qualify, and there may be other stipulations. Call your local department of emergency management or your regional council of governments to find out. does anyone have any ideas on a deep well hand pump I can buy to keep on hand in case my electric pump fails? Here is a source I dug up to tell you more about any water well grants in your area. You can go to eHow, and look up Grants for a Water Well. Right now, a 3000 gallon tank sells for about $1400.00 and are occasionally deeper discounted. These are green plastic tanks usable for potable water. I harvest rainwater from the roof of my shop and keep several of these barrels filled. They are great for gardens and washing cars (connected to a pressure washer via freeze proof hydrant). Of course they are also connected to the house with buried 2″ pipe.